Our program is based on a 9-month season that runs from September through our recital in June. Class tuition is divided into 9 equal monthly payments. Monthly tuition is the same each month regardless of attendance, school closures, and holiday vacations. Class tuition is due the 1st of each month. If payment is not received by the 10th of each month, a late fee of $10 will be assessed (for each outstanding balance per account, per month). A $35 fee will be assessed for each returned check. Payments may be made by check, cash, Visa, MasterCard, or Auto-Pay. You can also make payments online via the Parent Portal. Auto-Pay is an easy way to pay your account. Simply register with the front desk and we will automatically charge your credit/debit card on the 1st of each month. We do not prorate tuition, however, if we cancel a scheduled class you will receive a credit on your account. Recital Tickets — Tickets for our Annual Spring Show at the Capitol Theatre run approximately $15 per ticket. 10% discount will be applied for subsequent family members. Pay your annual tuition (September-May) by cash/check before September 17th and receive a 10% discount. Discount does not apply to Dance Explosion tuition and will exclude the sibling discount. Private lessons can be schedule with your instructor. 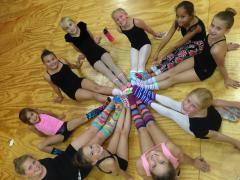 Students must dress appropriately for dance class. Hair should be pulled back and out of your child's face. Please do not wear your dance shoes outside or your street shoes inside on the studio floor. Individual instructors may permit variations of the dress code. Pre K through 1st Grade: Any color leotard, skirt, tights and pink ballet shoes. 2nd grade and up: Black leotard, skirt and or booty shorts and pink ballet shoes. Hair in a bun. Leggings, shorts, tank top or sports bra are all allowed. Tennis shoes must be worn for this class. Leggings, shorts, tank tops or sports bras are all allowed. Both tennis shoes and jazz shoes will be used during this hour. Shorts, tank or t-shirt, hair in a pony, tennis shoes. No jewelry. For the benefit of all students, parents are allowed to watch class the first lesson of each month only. We are willing to make exceptions for special requests (example: Grandma and Grandpa are in town.) Please clear with instructor prior to your child's class. Our annual recital is held each year in June at the Capitol Theatre. Assigned seated Tickets for the Recital will go on sale in May. Each student will be responsible for purchasing a costume for each routine they perform in. The costume fee does not include tights, props, and appropriate dance shoes for performances. A $40 costume deposit (per routine) is due by November 1st. The remainder of your costume balance is due in January during costume week when all costumes are chosen. If your costume balance is paid after January 11th, additional shipping charges will be added to your account, along with a $10 late fee (per costume). No costumes will be ordered without full payment. All costumes are non-refundable and no costumes will be handed out to any student with an outstanding account. You may not drop or change classes in the current month you are in. An add/drop class form must be filled out by the 25th of the current month to be effective for the following month. Your class will not be dropped or added just by informing your instructor. Monthly Newsletters are emailed out and uploaded to your Parent Portal each month. Visit our website to stay up to date on upcoming events, newsletters and policies.